Your blinds are manufactured in our own UK factory based in Fareham, Hampshire using quality fabrics and components and throughout the manufacturing process of your blinds, quality is monitored and controlled using a traceability system which records who was involved with each stage of production. Once the blinds are finished and before they leave the factory, they are hung, tested for smooth operation and given a final inspection. By manufacturing and installing our own blinds it allows you to have complete confidence in our products and service and, in the unlikely event of there being a problem, we are able to, and we will, resolve it quickly and without fuss. All blinds, sails and shutters have a 5 year guarantee which means that should there be any faults with your blinds, sails or shutters within 5 Years from the date of installation we will rectify any problems. For full terms & conditions of our 5 Year Guarantee click here. 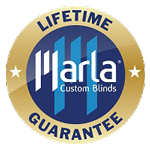 In some cases, the terms of our 5 year guarantee may be tailored to your specific blinds and installation due to the complexity of your blinds and/or the installation. Our guarantee is designed to ensure that should anything go wrong then it is rectified with the minimum of inconvenience to you. Our annual valet service is designed to ensure your blinds are maintained in top condition and if you have not taken the Lifetime Guarantee we would still recommend you make use of this service occasionally to ensure trouble free operation and a longer life for your blinds.